Hunter's Chocolate Chip Cookies - Chocolate Chocolate and More! Warm from the oven Hunter’s Chocolate Chip Cookies with just a hint of spice always make for a sweet treat after school or for dessert! 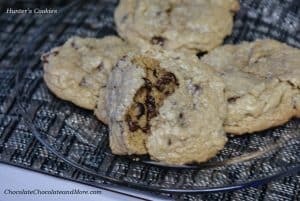 Chocolate chip cookies are one of my all-time favorite sweet treats, and a basic recipe is as easy to find as the back of a bag of chocolate chips. But I am always searching for new twists on this classic cookie, and in this case, it meant spotting a great base cookie recipe and making a few substitutions to get a sweet and gooey end result. I am a big Washington Capitals hockey fan, and a few weeks back, someone posted pictures of an old cookbook filled with both savory and sweet recipes from the players and coaches of the 1992 team. Dale Hunter was first a player, and then later a coach, with the Capitals; in this cookbook he had a cookie recipe he called “Hermit Cookies”. The original recipe sounded delicious, and includes cinnamon, nutmeg, dates, raisins, coconut, and walnuts, but I thought it looked like it would make an even better chocolate chip cookie! 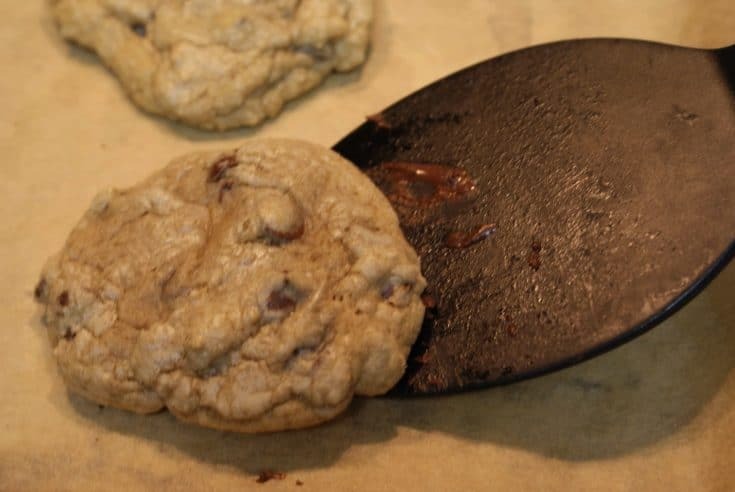 So now I present to you a chocolate chip cookie recipe I have re-named “Hunter’s (Chocolate Chip) Cookies” in honor of Dale Hunter – and my Washington Capitals (LETS GO CAPS!). In a bowl, combine flour, baking soda, baking powder, and spices; set aside. Using a stand or hand mixer, cream together butter and sugar in a large bowl. Add eggs and vanilla to butter and sugar and mix until combined. Gradually add flour mixture to batter and blend well at low speed. Fold bag of chocolate chips into the dough. Drop dough by spoonfuls onto a greased cookie sheet, and place in center of oven. Bake approximately 10-12 minutes. Allow to cool 5 minutes on cookie sheet before transferring to wire cooling rack to finish cooling. 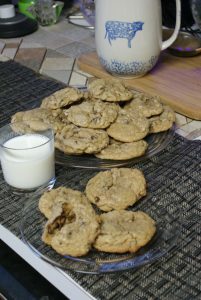 Note: If you would like to try the original Hermit Cookies recipe, you can replace the chocolate chips with 1 cup walnuts, 1 cup raisins, 1/2 cup dates, and 1/2 cup coconut. Also, drop the cooking time to 8-10 minutes, and don’t overcook. It is wonderful that you are keeping Joan’s blog alive — so many good recipes! And, I love old cookbooks, too! Thanks Joanne, We hope you keep coming back. We have lots of family recipes to share. I will now stop looking for a better chocolate chip cookie. This recipe is the BEST. I did have to add up to 1 Tablespoon more flour, but that is the only change I made. Love your site. Thanks for the feedback Lahli. Glad you liked the cookies! SO glad you liked the cookies Lahli!!! Thanks for reading and sharing!